Sybille Cohen originally from Hamburg, moved to Northern California in 2001. She is director of the Bay Area KinderStube (short BAKS) a full-immersion German-language preschool for children between the ages of 2.5 and 5 years in Albany, a city very close to Berkeley. 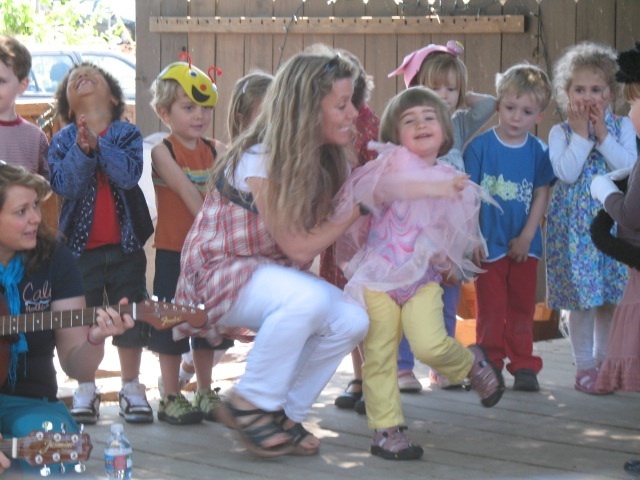 She has been teaching children from infants to preschool age over her extensive career and taught also as a teacher at the German Language School in Novato. When coming to California initially, she didn’t have much of a plan but was ready for an adventure. And in fact the trip turned into the adventure of her lifetime. During her stay she met her now husband and made California her home. Sybille you arrived in California about 10 years ago. What made you leave Germany? This is a great question. I think I was just ready for a change and an adventure. I wanted to do something completely new. I had not seen or traveled ever before so I took a sabbatical from work and just went. California came to mind because I had a friend whose aunt lives here in San Anselmo. I just wanted to experience something new and get to know a different culture. What was your first impression when you arrived here in CA? How long did you initially plan on staying in the USA?
. Initially I had planned on staying for 6 month. But everything changed when I met my husband to be. 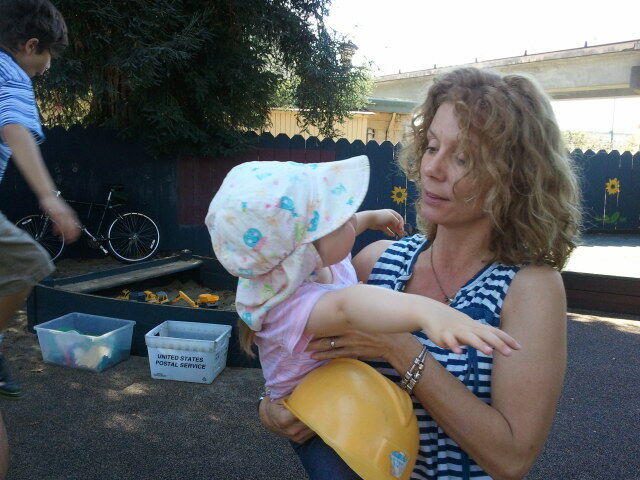 During my stay I was asked if I would like to work as an Au pair for a widowed father who had two boys. I took the job and a couple of months later I found myself in love with the nicest man I’ve ever met, the dad himself! When my visa was about to expire there weren’t many options for us to have me staying longer especially since this was after 9/11. After consulting with an immigration lawyer we spontaneously decided to get married, and this after only nine months of being together! Would I have ever done something like this in Germany? Hell no! But it was one of the best decisions I have ever made! Since it was such an unforeseen change in plan, was it hard leaving family in Germany behind? What was your family’s reaction?
. It was very difficult to leave family and friends behind! It was probably one of the most difficult decisions I ever had to make. For many years I lived in, or better between two worlds, which means, when I was in Germany I wanted to be in the US and vice versa. By now I am content and I enjoy my stays in Germany and am happy when I’m home. Home for me now is California. Moving to California turned out to be a very tough change for my family back in Germany. The one most affected by it was my mother since I have a very close connection with her. But in the long run we rearranged our lives and we found a way that it now works for both sides. I’m trying to visit them once a year at least, which is very important to me, especially now as they get older. Given the option, would you consider moving back to Germany at some point?
. This is a tricky question. At this point in my life I’m not considering moving back to Germany because everything my life revolves around is here. The US has become my home. Germany on the other hand will always be special for me, since this is where I’m coming from. I am German in my heart and always will be! You have been working with BAKS (Bay Area Kinderstube) since 2007 and since 2009 you are the school’s director. Please tell us a bit about BAKS. BAKS started out as a parent initiative in 1994 and became a private pre-school open to the public in 1997. We are a full immersion German language pre-school, which means that we exclusively speak German with our children. The German language development takes an integral part of the social, emotional, and cognitive development of our children. We not only teach but ‘live’ the language so that it becomes a natural part of our students’ life. We have many different activities throughout the day from reading, singing, art and dancing to nature explorations, and we also cook and bake together. Since this school year we offer also martial art lessons once a week, alternating with yoga sessions as part of our curriculum! There is a long waiting list to get a space at Bay Area KinderStube. What’s the success of BAKS?
. In my opinion KinderStube’s success results in the fact that we are not only a childcare center. KinderStube has the feeling of home probably because it is small and therefore homelike. We have no more than 24 children in our morning program. With 4 teachers on site we have a great teacher/child ration of 1:6. In our afternoon session our ration is 2:12. The other component to our success is that we have very compassionate teachers. We always try to understand each child in his or her own way. Our goal is to get the best out of each one of them and make them feel accepted as an individual. We want to give them a feel of belonging. What are the prerequisites, if any, for a child to start at BAKS?
. It is always a plus when the child has already some knowledge of the German Language but it is not a must. The one thing we are looking for is that one parent is able to speak the language and that it is spoken to the child outside of our school. Can you share some advice with our readers on whether to start their child in a traditional American pre-school or a German immersion pre-school?
. I do know both school systems and I have to say that the decision which route to go depends really on the parents and on what they think is best for their child. The big difference between these two systems is that the German system is not as academic in preschool and Kindergarten as the American. Kids learn to write and read in first grade, which I think is early enough considering the amount of school years still ahead of the child. But it also depends on the child itself. Is he or she already interested in reading, writing, and wants to learn more the parent should address it as well. On the other hand, is your child not an early “starter “, then don’t worry to give him or her a little more time and let them play a year longer. It won’t matter in the long run. Sybille, thank you so much for your time and for sharing your insights with us. We wish you and BAKS continued success! If you would like to visit BAKS – Bay Area KinderStube, you can just call for an appointment or come by to the “Laternenfest” (lantern fest) this Sunday November 13th at 5pm. There will be Glühwein, Hot chocolate “Weckmänner” and Hot Dogs . For sale will also be German children books and lanterns for the children who don’t have any but would like to participate at the lantern walk. The festive evening will start out with fall season’s songs and have its highlight in the presentation of the St. Martin’s play presented by the KinderStube “Füchse”. The following lantern procession will conclude the evening. At the end there will be a raffle with 5 opulently filled Gift baskets with the proceeds going towards buying new wood chairs and tables for the school.